The protests start off small, but their voices echo throughout an entire country. The government had rejected an opportunity to make a free trade deal with the European Union and the people had had enough. The message grew along with the crowds of people: their President, Viktor F. Yanukovich, had to go. What was once a student demonstration had transformed into a revolution. 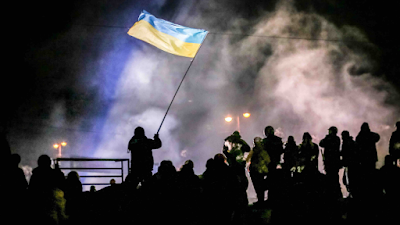 Their fight for freedom became just that, a fight, as the police fill the streets and the blood of Ukrainian citizens begins to spill onto the concrete. The atmosphere is electric for both the right and wrong reasons, as it is inspiring to see everyday people rise up in order to change the world and yet devastating to see their bodies go limp and the tears rain down from those still breathing. 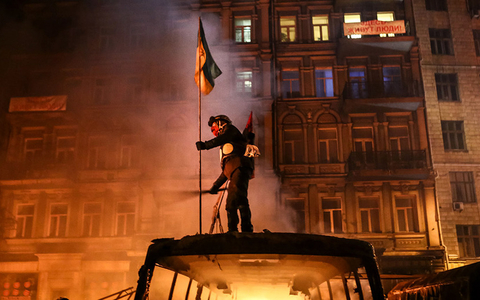 The part that makes Winter on Fire: Ukraine's Fight for Freedom so haunting is that it is all real. It all really happened over the course of 93 days starting in 2013 and carrying over into the following year. Knowing this makes the absolutely amazing imagery seen throughout the picture that much more memorable, as a flag flapping in the wind through a cloud of smoke projects so much more power when you know it flies for fact instead of fiction. A camera crew is right there during this revolution, documenting the chaos and carnage happening literally feet away from them and the claustrophobic nature of this type of filmmaking is jarring and unforgettable. I felt like I could feel the heat of the fire. I experienced a lack of comfort as if the bullets could somehow hit me all while sitting on my couch, which made the realization that my safety was a luxury others clearly aren't always afforded that much more nauseating. This is a Netflix original documentary much like a film from 2013 titled The Square, and the subject matter is extremely similar. It should come as no surprise that Winter on Fire is now my favorite doc of 2015 since The Square took that title two years earlier, as I find films like this to be riveting and not just while I am watching. The horrors of war taking place in front of my eyes linger with me long after I have moved on to other things. No matter how hard of a pill this film is too swallow, it's too mesmerizing and important to ignore.